Siriki Dembele could start for Posh against Gillingham. Darren Ferguson believes Posh will have to win ‘four, maybe five’ of their remaining seven League One matches to have a chance of reaching the League One play-offs. 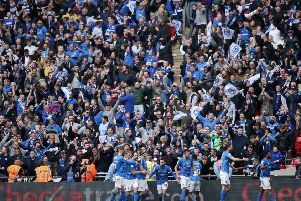 Posh start playing catch-up on sixth-placed Doncaster on Saturday (April 6) when improving Gillingham visit the ABAX Stadium. Posh will seek back-to-back League One wins for the first time since October having won their last match 2-0 at home to struggling Southend on March 23. Posh lost ground on Doncaster last weekend as they didn’t have a fixture. Ferguson used the opportunity to watch Gillingham’s 1-1 home draw with relegation-threatened Rochdale. “Gillingham have threats, there is no doubt about that,” Ferguson said. “Their front three of Tom Eaves, Graeme Burke and Brandon Hanlon look a real handful. “We will have to defend as well as we did against Southend to get the result we want. “The game itself was very scrappy and very stop-start, but you could still see Gillingham are a team in pretty good form and with plenty of confidence. “They’ve been doing well away from home in particular. The 2-2 draw at Luton recently was a standout result, while they also won well at Wimbledon. It will be a tough game, but a good one. “It’s obvious what we have to do between now and the end of the season. If we string a consistent run of positive results together we can finish sixth. “Doncaster have won twice since we last played, but our own aims haven’t changed because of those results. We were always going to have to win four, maybe five games to finish in the play-offs. “I don’t want to put an actual figure on what we need, but 72 points is usually the number required for the play-offs and we have 58 at the moment. Ferguson has a fully fit squad to pick from as centre-backs Rhys Bennett and Josh Knight both came through 45 minute run-outs for Posh reserves in a 1-1 Central League draw with Plymouth on Tuesday. Siriki Dembele played for 60 minutes in that game and he could start against Gillingham.